The financial impact of cancer diagnosis and treatment can be considerable to individuals and their households, leading to changes in treatment decision making. 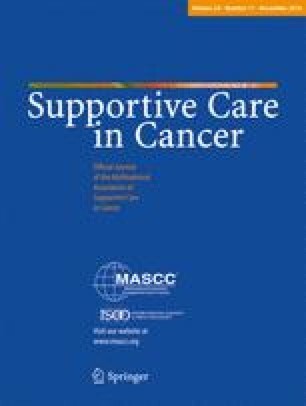 This study aimed to quantify effects on income and employment; describe how cost-related factors influence treatment decision making and need for financial assistance; and to identify patient sociodemographic factors associated with treatment decision making, use of financial assistance and financial effects. A cross-sectional self-report questionnaire was administered to oncology outpatients from two hospitals in Australia: one regional and one metropolitan. Of 255 participants, 67 % indicated a change in employment and 63 % of those reported reduced household income since their diagnosis. Travel (15 %), loss of income (14 %) and cost of treatments (11 %) were commonly cited factors influencing treatment decision making. Seventy-four percent of participants reported that they did not access financial assistance, with more than a third (37 %) of those being unaware that financial assistance was available. Being currently not employed and more recent diagnosis were associated with a reduced income since diagnosis. After adjusting for employment status and age, patients with private health insurance had higher odds of reporting that financial factors had influenced treatment decision making (OR = 2.5). Unemployment is a major driver of the financial impact of cancer. The costs of treatment may be particularly challenging for those with private health insurance who are more likely to be treated in the private health system where out-of-pocket costs are greater. Improved access to financial assistance is required to better avoid potential inequities. This research was supported by a National Health & Medical Research Council Project Grant (ID 1010536), a Strategic Research Partnership Grant (CSR 11-02) from Cancer Council NSW to the Newcastle Cancer Control Collaborative (New-3C) and infrastructure funding from the Hunter Medical Research Institute (HMRI). Christine Paul is supported by an NHMRC Career Development Fellowship (APP1061335). Allison Boyes is supported by National Health & Medical Research Council (APP1073317) and Cancer Institute NSW (13/ECF/1-37) Early Career Fellowships. Our thanks go to the participating cancer treatment centres; the patients who kindly completed the survey; Rochelle Smits, Alison Zucca, Heidi Turon and Hannah Small for research support; and Sandra Dowley for data management.